First off, blueberries have amazing benefits for your skin, because they contain antioxidants. (Antioxidants are molecules that inhibit oxidation of other molecules. Oxidation is a chemical reaction that leads to chain reactions that may damage in the cells.) Blueberries also contain a wide range of vitamins and minerals that help in regaining hormonal balance which can counteracts acne. Blueberries also prevent damage done by sun and pollution and this is why blueberries are considered effective for skin rejuvenation. They smooth wrinkles and improve the overall texture of skin. Now we call that a WIN! These little blue superheroes are also gallic rich and some research suggests they can kill tumors without harming good cells, unlike radiation and chemotherapy. The Journal of Biochemical and Molecular Toxicology published a study analyzing gallic acid and the anti-cancerous effects on breast cancer cells. Blueberries were able to destroy the cancer cells because they are rich in gallic acid and reseveratrol. Don’t get us wrong – they aren’t a cure for cancer, but they are a potent warrior in your fight against it. Blueberries also have high levels of phenols, specifically gallic acid which helps in boosting the brain functions. Also known as “neuro-protective agents,” researchers say that they protect brains from degeneration, neurotoxicity, and oxidative stress. Studies found that blueberries slow down cognitive decline and advance memory and motor function. Need even more evidence that blueberries are truly super? Well, they also help digestion AND are really beneficial to your heart! University of Maine researchers found that blueberries can stimulate the growth of good bacteria and their soluble and insoluble fibers help to regulate the gastrointestinal tract. Plus, according to U.S. Highbush Blueberry Council, the antioxidants in blueberries reduce the buildup of bad cholesterol (LDL) in the walls of arteries, lowering the risk of cardiovascular diseases and stroke. The journal Circulation also published a survey that said consuming strawberries and blueberries together decreases the risk of heart attacks by up to 33%. 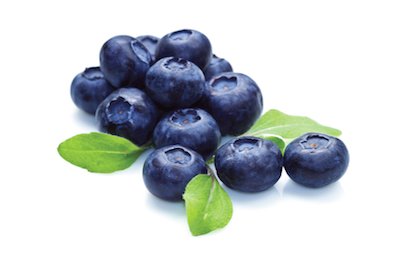 And last, but not least, blueberries, one on nature’s true super-food warriors, help in the battle of the bulge! Blueberries are low in calories and low on the glycemic index (the number ranking that indicates a food’s effect on a person’s blood glucose level.) Add that to their high fiber content and you feel full longer, helping to control your appetite, which leads to weight loss. So, as Michigan’s blueberry season kicks off head out to your local grocer or farmer’s markets. Buy them by the crate, eat some fresh, then freeze the rest to eat throughout our long, cold winters and let their health benefits last all year long!